I wanted to use the Gold Ball turnips that I had purchased this weekend. This is what I did. I put the turnip, broccoli, carrot, seitan, basil, and sugar water into my Instant Pot pressure cooker. I set it on schedule to cook for 3 minutes; I stuck with high pressure though I bet low pressure would suffice. I found red chard on sale at our coop today; we've not had chard in a while, and I had a head of cauliflower in the refrigerator, so I thought of cooking a chard and cauliflower dish. Preparing it waterlessly (using a quality Saladmaster pan and cooking, covered, on low) sounded good. Here is what I did. I also had some fresh French baguette, and sauteed on a cast iron pan with no oil (I first maybe 1/2 t canola oil on the warming pan for half a minute then wiped the oil off just to get a very light coating on the pan) some tempeh. Everybody liked dinner! The cauliflower was good but could have cooked just a bit more to be more tender. A little more turmeric would have made the color more vibrant (and, of course, more healthy). While I love pressure cooking, I always also get good results with waterless cooking. I love what the pressure cooker (very soft and, cooked for a few minutes, gravy-like) and waterless cooking (tender) does to cauliflower. I should experiment with more waterless cauliflower dishes - more vegetables like carrots, peas, and green beans would be good. A surprise element like pomegranate kernels would be fun. 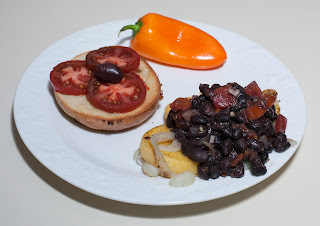 I was thinking of making a black bean dish and wanted to integrate polenta, which I had in stock prepared as a tube. Originally, I was thinking of chopping the polenta and mixing it in, but my daughter was talking about crispy polenta, so I decided to cook the polenta separately on a cast iron pan. I had some beans leftover from a few days ago, so didn't have to prepare them again in my Instant Pot. Here is what I did. I started heating the beans, onion, garlic, bell pepper, canned diced tomato, and salt on low. I wiped a little bit of canola oil on a cast iron pan as it heated on medium heat; about half a minute later, I wiped the oil with a paper towel, leaving a light coating on the pan (I wanted crispy polenta), then put the polenta on the pan. I cooked it, flipping occasionally, and adding the onion a few minutes into the cooking. When the polenta was crispy, I served it with the onion, and put the beans (first mixing in oregano) atop. A bagel half with tomato and olive, plus a baby bell pepper, completed the meal. I should make crispy polenta dishes more often. Capers, olives, fresh tomato, tomato sauce, basil, cashew "cheese" sauce, and many other foods could go well with polenta. I put into a large Saladmaster stock pan, in this order, the onion, garlic, mushroom, artichoke, and miso. I heated, covered, the pan on medium heat till the vapor release began gently rattling, then I reduced the heat to low and cooked. With waterless cooking, 20m seems to be about right for dishes I make - longer cook times are also okay, as essentially a convection is set up and the food is just kept hot but not burnt. While the artichokes were cooking, I roasted the bell pepper by putting it on the open flame of my gas range, turning it until it was all coated in a black char. I put the bell pepper in a brown paper bag, closed the bag, and let it sit to imbue the pepper with the smoky flavor. When I was ready to serve the artichoke, I removed the pepper from the bag, and had my daughter help to run water over the pepper and rub the black char off. After removing the seeds and membranes, I chopped the pepper into approximately 3/4" pieces. I turned the heat off to the artichokes and mixed in the pepper, tarragon, salt, and pepper, and served. Wow, I loved dinner, and so did my family and a friend who came for dinner. The artichokes were divine! I so loved this combination and the great soft texture that the waterless cooking gave the artichokes. This was one of my favorite artichoke dishes I've had. I have cooked artichokes waterlessly before, but maybe the mushroom and miso or something else about today's preparation made the dish so memorably excellent. The chickpeas were also quite good - I liked them but my wife raved and claimed that this was the best way I ever prepared chickpeas. I will make more waterless artichoke dishes! I'll explore more combinations; capers and olives would be good. I might want to make a homogenized spread to put atop pasta or maybe a bagel. Happy Valentine's Day! My family likes Brussels Sprouts but my wife prefers them pan cooked and charred, not steamed or pressure cooked, as I usually prepare them. I had the idea initially of braising Brussels Sprouts after oven roasting them and then pan sauteeing them, perhaps cooking them, covered, with broth as a final step. I thought of cutting fresh tomato into heart-shaped like sections and using them in the main dish for the Valentine's theme. Here is what I did. I had some beans in a tomato sauce that I heated up as a side dish. A generous slice of avocado completed the Valentine's meal. As I was cooking the Sprouts, I was quite pleased with how crispy and charred they got with almost no oil at all (I list this dish as no added fat as I really just swiped on enough oil to just barely coat the pan; any oil absorbed into the food would be a trivial amount), and decided to forego braising. It came out great - we all loved the dish! This is a real winner and a fun dish that goes from (toaster) oven to cast iron, then to mixing bowl. It is simple with just a few ingredients, and the flavor shines. I was surprised at how good this came out - maybe it was just the relative novelty of the charred Brussels Sprouts vs. the pressure cooking that I usually use with them. I had considered mixing in liquid smoke, but other than a bit of hot sauce (which really wasn't even necessary), the dish was quite flavorful as it was. Capers might add a nice addition instead of salt. I'd love to make more crispy Brussels Sprout dishes, perhaps with root vegetables like sweet potatoes or carrots. I had the idea of doing some sort of a saute of fennel with seitan. I ended up essentially braising (though not strictly as I didn't cover the pan with liquid) and came up with an interesting meal. Here is what I did. I put the garlic in a Saladmaster skillet with no oil and sauteed over medium heat, stirring occasionally, for about 2 or 3 minutes, letting the garlic develop a nice bouquet and soften a bit. I then added the fennel and continued the saute for another 8-10m or so, till the fennel was softened and some pieces were slightly browned. I added the seitan, stirred, and continued to saute just for another 2 minutes or so. I used frozen peas and added them, continuing to cook for another 5 minutes (if I used fresh, I'd add at the very end). I also made some brown rice pasta, with dried oregano and sliced olives. Dinner was even better than I expected! I normally like fennel in small quantity and feared that this would be too much, but the cooking perfectly mellowed out the fennel. I liked the chunks of seitan and am glad that I didn't use thin slices. The rice was also very good. Braised fennel is a good idea! I also have not cooked with sauteeing followed by cooking down with broth. This served the duplicate purpose of cleaning up any minimal sticking in my pan. I need to try a true braise with covering the dish. I should try a tougher ingredient than seitan to see how braising softens it - maybe fibrous kale stems? Braised fennel with tofu or tempeh would be good. This was a winning combination tonight!